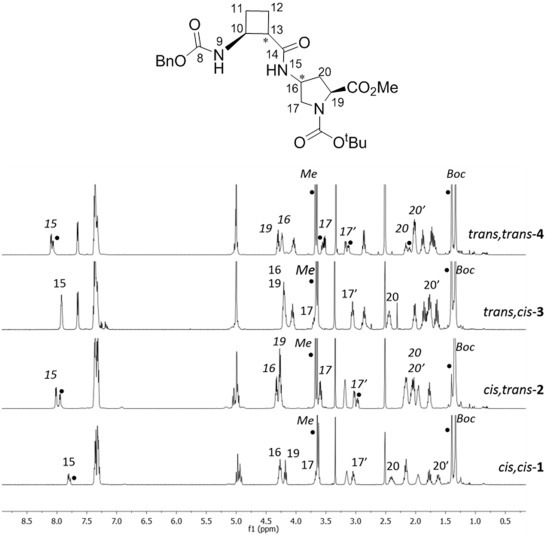 Four new series of diastereomeric β,γ-di- and β,γ-tetrapeptides derived from conveniently protected (1R,2S)- and (1S,2S)-2-aminocyclobutane-1-carboxylic acid and cis- and trans-γ-amino-l-proline joined in alternation have been synthesized. High resolution NMR experiments show that peptides containing trans-cyclobutane amino acid residues adopt a more folded structure in solution than those containing a cis-cyclobutane residue, which adopt a strand-like structure. The cis/trans relative configuration of the cyclobutane residue is the origin of the folding pattern of each peptide due to either intra- or inter-residue hydrogen-bonded ring formation, whereas the cis/trans isomerism of the γ-amino-l-proline residue does not have a significantly relevant role on the folding ability of these peptides.